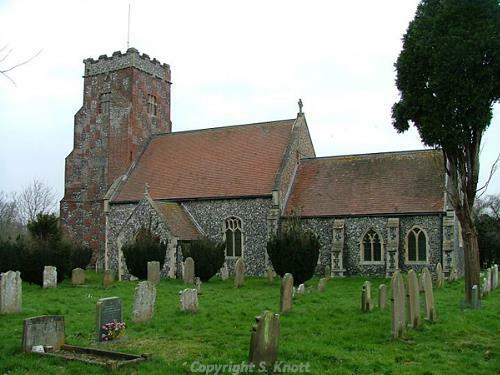 Wheatacre is a small parish in the South Norfolk Local Government District, with an area of 440 hectares. It contains the settlement of Wheatacre, and the Wheatacre Marshes which border the River Waveney. The name Wheatacre is thought to derive from the Old English words for arable land used for wheat. The earliest object to be recovered from the parish is a Mesolithic flint knife (NHER 10743). No monuments or objects from the Neolithic period have been recorded, however the work of the Norfolk National Mapping Programme to interpret cropmarks recorded on aerial photographs has greatly added to our understanding of Bronze Age and late prehistoric or Iron Age monuments. As a result three Bronze Age round barrows have been identified (NHER 44879, 44982 and 44979), as well as a causewayed ring ditch (NHER 44977) which may date to the Neolithic to Bronze Age in date, and a probable Bronze Age penannular ring ditch (NHER 44978). A number of late prehistoric or Iron Age monuments have also been recorded, and these include a field system (NHER 44959) and field boundaries (NHER 45228 and 44965) which may also be of Roman date, as well as a possible Iron Age barrow (NHER 44980) and enclosures (NHER 44983). No objects from the Iron Age have been recorded, and there are no recorded objects or monuments known to have derived from the Roman period. There are also no recorded objects or monuments from the Saxon period, although the settlement of Wheatacre is listed in the Domesday Book of 1086. In fact, it appears to be a large and populous area, containing both cattle, pigs, sheep, beehives and even listed as having two churches. Although no surviving churches are recorded in the parish for this period, All Saint’s Church (NHER 10755) is the oldest surviving building in the parish and dates from the medieval period. It has an extraordinary early 16th century west tower of red brick and flint in a chequerboard pattern. It is thought that the current nave was also rebuilt at this time, so the early history of the building, and whether it is in fact one of the two listed in the Domesday Book, is unclear. Objects from the medieval period are unfortunately limited to pottery sherds and fragments of a copper alloy strip and a gilt terminal (NHER 23759). No objects from the post medieval period have been recovered. From more recent history, the Black Mill (NHER 10716) still survives. It was built in the early 19th century as a steam pumping engine house, and has a tall tapering square chimney. The sites of two World War Two features are also recorded, comprising a barbed wire obstruction on the Wheatacre Marshes (NHER 43666) and a gun emplacement (NHER 44960). The earthworks of two bomb craters (NHER 44961) and a pillbox situated on the railway embankment (NHER 18082) are thought to survive today.